On Sunday 03/07/11 I was so excited to go out and read the Sunday Times which I was featured in (you can read it here if you missed it!). After I had received all my messages of congratulations from friends and family I didn’t really think the day could get much better!! Settled down for the evening, my phone just suddenly started going crazy! When I checked there was mentions coming through with my name and these three magic letters – S B S.
This might not mean much to you if you are not a Twitter user so let me explain! SBS stands for Small Business Sunday, run by Theo Paphitis, self made millionaire and Dragons Den Dragon, each Sunday between 5pm and 7:30pm. 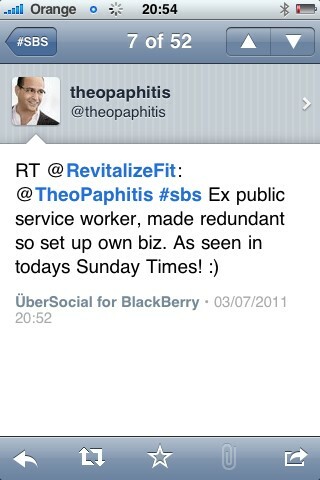 All entrants write a Tweet (140 character message) mentioning Theo and the hashtag #SBS. Theo then looks through all the entries and picks 6 winners to share with his followers. It didn’t actually sink in at first and I had to check my Retweets to see that Theo had picked my entry and retweet it to his 140,401 followers. Both my article and winning SBS has made this week crazy with 3 new clients signing up, further articles to arrange and interviews to prepare for! If you are a small business owner and you are on Twitter I strongly recommend entering SBS!